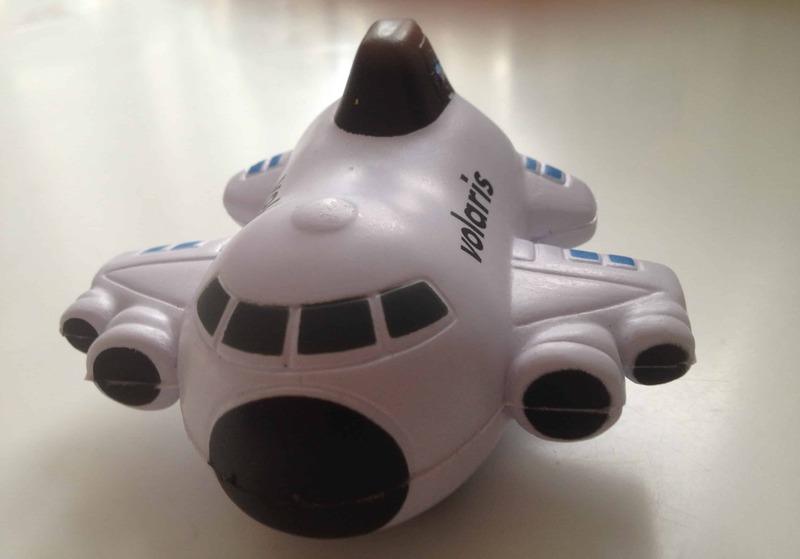 What is it like to fly Volaris? Recently, we booked a last-minute flight from Leon/Guanajuato (in Central Mexico) to Cancun on the eastern coast. The only direct flight we found between the two cities was on Volaris. Admittedly, I’m always a bit fearful of flying a new-to-me airline. But friends in Mexico reassured my husband and I that a flight on Volaris would be fine. Mexican nationals refer to the airline as the Jet Blue of Mexico: It’s a popular low-cost airline that makes flying more affordable because of its competitive pricing strategy. No two flights on any airline offer the exact same experience, but here is some info about our experience that might help you know what to expect. In operation for about seven years, the airline is the second largest airline in Mexico, after Aeromexico, and is growing rapidly. Volaris offers routes between 29 cities in Mexico, and flies internationally to six cities in California, and to Las Vegas, Denver and Chicago. Similar to some U.S.-based airlines (Spirit Airlines being one notable example), passengers need to be vigilant about additional baggage fees, which can inflate the base price of a ticket considerably. Baggage limitations only allowed us to check one under 33-pound suitcase for free. Since we had flown to Mexico from the U.S. on United Air Lines and had planned to stay a couple of weeks, we had packed so we wouldn’t exceed a 50-pound baggage limit. In addition, Volaris permitted only the smallest carry-on because there is virtually no overhead storage space. Thus, we wound up purchasing an additional 44 pounds of checked baggage weight for each of us (22 or 44 extra pounds can be purchased per person) at an extra cost of about $49. We made the extra baggage purchase online prior to our flight. It would have been less expensive if we had purchased the excess baggage allowance at the time the ticket was bought. If you only find out you have exceeded baggage limits at check-in, you will pay even more. In fact, it can be up to 90 percent cheaper to pay the surcharge in advance of your airport arrival. We flew on an Airbus A319 regional jet, with two seats on each side of the aisle. Legroom and the pitch of the seats were reasonable. The flying experience was a bit livelier than usual because the plane was filled with families with children. A video with flight safety information instructions was offered in Spanish with English subtitles. All announcements made by the crew were in both Spanish and English. Because our plane was small, there was only one flight attendant. Like most people we met in central Mexico, he was courteous and solicitous to passengers. The onboard snack was a package of Sabritas, a Mexican brand of potato chips— perhaps high in salt but a nice indulgence for dieters at only 94 calories per pack. Tequila, beer and soda were free and the flight attendant offered two rounds of service. There was nothing to speak of on board but Volaris has developed a free app for iPads, iPhones, and Android phones to help you book flights and track their status. The flight was comfortable, took off and arrived on time. We would fly it again. For more information, including routes, see the Volaris website (which can be viewed in Spanish and English). An update on Volaris plans for expansion on Skift. This is one of a series of posts about my experiences on new-to-me airlines. Surely, each flight is different but it’s always helpful to get general impressions of what to expect before you fly. If you fly Volaris and have a very different experience, please feel free to comment below. What is it like to fly Aeromexico? What is it like to fly British Airways? What is it like to fly Interjet? What is it like to fly JetBlue? What is it like to fly Swiss International Airlines? The flying experience was a bit livelier than usual because the plane was filled with families with children. If you don’t like hearing kids crying then drive their instead. Or buy ear plugs. When we were in Mexico last year, we took several first class buses (Premier Plus) between cities and were quite favorably impressed. I think some people think of falling apart buses with goats and chickens along with the passengers when they think of public transportation in Mexico. I suppose you can still find those, but there seemed to be plenty of satisfactory options. Do you have any more posts about San Miguel de Allende in the hopper? I heard the buses are terrific, too. We met a man who splits his time between Florida and San Miguel de Allende, who always opts for the bus to and from the Mexico City airport. Of course, I’ll be writing more about San Miguel de Allende. Stay tuned!